Mazen Hassoun. Picture courtesy of the author. Co-founder of the online outlet Raqqa Post, twenty-one year old Syrian researcher Mazen Hassoun has found asylum in Germany, where he is trying to lay the bricks for a career in journalism, a job he associates with exposing crimes and giving the "voice back to the voiceless". In the meantime, he is also recovering from the traumas and memories left by the brutality of the Assad regime as well as the horror of the Islamic State, that made Raqqa its de facto capital. He has nevertheless agreed to discuss the history of his city as well as the deep impact left on the civilians by the months-long bombardment by the US-led coalition, accused of war crimes by a recent report from Amnesty International. Anton Mukhamedov: A period in the history of the Syrian war which frequently tends to be left out in most stories is the brief window between Assad's loss of control over Raqqa and the city's capture by the Islamic State (also known as ISIS). Could you tell me more about it? Mazen Hassoun: Raqqa was liberated from the Assad regime in March 2013. The Free Syrian Army and the other opposition groups entered the city. After a battle that lasted only three or four days, the city was completely under the control of the opposition. From then until January 2014, we experienced freedom. We could speak our minds. But in January 2014, the arrival of ISIS changed everything. My cousin was executed on January 10. The FSA was driven out of Raqqa. All of us activists who had worked for the revolution and stood against Bashar al-Assad fled the city. I was among the first to leave in January 2014 when ISIS gained full control of the city and there was no one to defend us. My uncle wrote a book in Arabic about Raqqa’s revolutionary history, based on information and articles he has gathered in the past two years. Many people don’t know about it and have only heard of ISIS. I used to be part of a local coordination committee. We coordinated protests, covered the walls with graffiti and revolutionary flags. Around three hundred thousand civilians came out to one of our protests. We were among the first provinces to completely escape Assad regime’s control. At first, after the liberation, we had a lot of civilian organizations and movements for a new, democratic Syria. Most of the people demonstrating were poor or middle-class. We had built a lot of beautiful things before ISIS came to destroy them. Raqqa even used to be referred to as the “Capital of Liberation”. 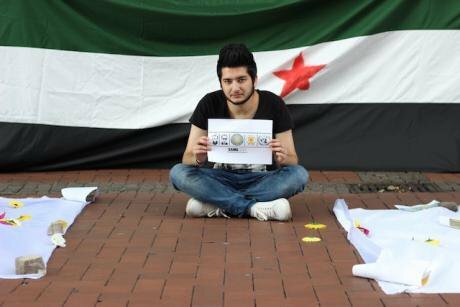 I used to protest and demonstrate against Bahar al-Assad even when I was just sixteen or seventeen, from the very start. My family had suffered a lot from the regime. My uncle had been in prison for twelve years under Hafez al-Assad. Another uncle was executed. I was raised in an opposition family, which is the main reason I joined the revolution. So how did ISIS come to dominate Raqqa? At the time, the opposition didn’t have much evidence that ISIS was responsible for the kidnappings and they managed to gain control over the city after an agreement with Ahrar al-Sham and Jabhat al-Nusra (JAN). [Interviewer’s note: those were two large Islamist groups present in Raqqa at the time, but officially unaffiliated with ISIS.] This agreement is well-known to all Raqqa residents who witnessed the beginning of 2014. At first, there were only two hundred ISIS fighters. Ahrar al-Sham, on the other hand, had about two thousand members. I believe an exchange between the armed groups happened: Ahrar al-Sham withdrew from Raqqa, while ISIS withdrew from Idleb. I was actually watching the battle with ISIS at the time. I took my camera to film the events from the side of the Free Syrian Army. ISIS were surrounded in two buildings, with several kilometers of distance in between the two. That was around January 9, 2014. They were that close to losing the battle. But there are two bridges on the Euphrates river south of Raqqa, connecting the city with the rest of the country. Ahrar al-Sham and JAN had each held one bridge and suddenly they left the two, allowing ISIS reinforcements to come in from Aleppo, Idleb and the rest of Syria. Ahrar al-Sham and JAN withdrew shortly afterwards, leaving the remaining group, Liwa Thuwar al-Raqqa alone and unassisted. Liwa Thuwar al-Raqqa, which was part of the FSA, was outnumbered and unassisted, so they eventually lost. Do you think that at the time the US or other nations could have provided assistance to the Free Syrian Army thus preventing the rise of ISIS? They could have: everyone was capable of eliminating ISIS in 2014. The organization was still very weak and didn’t have much military might, vehicles or money. Had the international community supported the FSA during that period of time, we wouldn’t see any of these tragedies today and the terrorist attacks [committed by ISIS] probably would not have taken place. But everyone left ISIS grow until they became a large threat. Have you heard anything about those who had been kidnapped by ISIS, such as Father Paollo Dall’Oglio? I saw Paollo Dall’Oglio in Raqqa but didn’t actually get to know him. Until today, we still don’t know what happened to him. We launched a campaign “Where are the kidnapped by ISIS?” More than a thousand Raqqa civilians have been disappeared by ISIS, including one of my cousins. We heard many stories about Paollo Dall’Oglio: some said they executed him days after the arrest; a former member of ISIS claimed to have seen him at the Euphrates Damn around 2015. I think that if the SDF will investigate, as they have arrested many ISIS members, they could learn the truth. In the case of those Syrians disappeared by Assad, relatives can bribe the government to know the truth, but not with ISIS. Do you think Raqqa might still fall to Assad? It is the civilians’ greatest fear…We’re hearing about this possibility ever since Assad lost control of the city. If Russia agrees with the US that the SDF should leave the city, we will lose it and Assad will seek revenge from the citizens. When you founded the Raqqa Post website, the city was under ISIS rule…how did you communicate? I’m a co-founder of Raqqa Post and have worked on it with writers and activists… We founded it in October 2015. Communicating with Raqqa was the hardest thing ever. There were still a few internet cafés open and we had two contacts in the city working with us. They did their best to update us and send us news. We wouldn’t risk their lives to ask for photos or videos. In the last days of ISIS control of the city, during their battle with the SDF, it was extremely hard to connect with the people of Raqqa. There were no longer any Internet cafés open. Some citizen journalists in Raqqa, such as the group “Raqqa Is Being Slaughtered Silently”, have been on the receiving end of a lot of accusations of proximity with ISIS, from people sympathetic to the SDF. We have all been targeted by these accusations. Most of the time, they accused us of working for Erdogan. When we speak against ISIS or the Assad regime or SDF or any other faction, we will be accused of treason or being paid by someone outside. Even when we document the violations of the Syrian opposition, they also accused us to be some sort of agent. When someone is afraid of their violations being exposed, they accuse you. Would you like to pursue journalism as a career? I would like to study journalism in Germany, but the problem is that I have to finish high school first. When I left Raqqa, I was in the last year of high school. I almost finished the studies, but ISIS came and I couldn’t stay. Nobody had heard of Raqqa until that point and nobody knew what was happening. So I started posting breaking news on my Facebook page and then I co-founded Raqqa Post. What is the atmosphere in Raqqa currently like? It is almost catastrophic. The people are very tired. The city is in ruins, if you saw any footage of Raqqa,—and I talked with a contact there who told me the destruction you saw in videos or images was still nothing compared to the reality. Every single building is damaged and there is no way to live in the city. About twelve thousand Raqqa buildings have been destroyed in total. [For months after the battle] people [were] still dying daily because of the landmines. The death toll is still rising. The media did not really speak about this, they just mentioned that ISIS lost its de facto capital,—and few people care about what happens afterwards. Every family has lost a member because of the four years of war. The financial situation is not better. The people lost all their money and it has been four years of them struggling to make ends meet. Everyone talks a lot about rebuilding the city. I don’t think anyone will rebuild the city and fix the damage but the civilians themselves. The Coalition has been talking about repairing the water and electricity grid since October, but in January they had done nothing. They couldn’t even clear the mines fast enough. So after all this destruction, who do Raqqa citizens blame the most for everything you describe: Assad, ISIS, or perhaps the US? We blame everyone: all the factions have participated in the massacre. ISIS was holding the civilians hostage, while the Coalition was bombing them. The coalition targeted the civilians, sometimes on purpose. The civilian death toll was not as high under Obama as it became under Trump. There was less error. The Coalition doesn’t care who dies. Brett McGurk insists on the fact that the Coalition has killed six thousand ISIS members, but there simply weren’t that many. I think that they are counting the civilians among the alleged ISIS losses. Until now, not everyone has been able to come back. Until December 2017, the SDF was preventing the civilians from coming back. But who will come back to live in such a city: most of the people lost their houses. There was some stealing too. Some SDF fighters stole houses in the city back in October, when they first captured it. Nobody can defeat ISIS by bombing. Ten years later, a new ISIS will rise, so long as this ideology and hatred, made possible by bombing, prevails. Al-Qaeda was never defeated by bombs. Do you predict that ISIS’s grip on Raqqa will still exert its influence over the city for some time to come? Yes. ISIS has been responsible for many executions which amount to at least three thousand civilians killed. So revenge crimes will be a serious problem, especially since the SDF have released dozens of ISIS fighters [in the aftermath of the battle]. When you see the man who killed your brother walking free in the streets, you won’t leave him alone. This will be a problem after everyone returns to rebuild their homes. The children have been affected by ISIS ideology being taught in schools, but Raqqa citizens are working on this and building organizations to fight against ISIS indoctrination. But this situation cannot be allowed to remain unsolved. How do you feel about the course of the war? From a military perspective, we lost the war. We can only continue the political work. And I don’t trust the Syrian opposition anymore. Since Aleppo fell, they haven’t done anything: instead of opening any new front, they just stood there and watched the Assad regime advancing. I am a little angry at them, but in the end of the day, they are better than the Assad regime. When I speak of the Syrian opposition, I don’t include Hayat Tahrir al-Sham or what was previously called Jabhat al-Nusra. [Interviewer’s note: Hayat Tahrir al-Sham formed in January 2017 after a merger between Jabhat al-Nusra, a faction previously considered al-Qaida’s Syrian wing, and several other Islamist groups.] I put them in the same category as ISIS. Recently especially, Syrians have been rejecting Hayat Tahrir al-Sham: they are less respected than even four years ago. The only difference between them and ISIS is that they don’t execute as many civilians, but that is because they don’t have the same strength on the ground. They have the same ideology, though. Jabhat al-Nusra was initially created as part of ISIS but they grew apart afterwards. In the end, they are extremists. If HTS came in full control of Idleb and proclaimed it “Islamic territory”, the result would be the same as if ISIS had done it. Do you think that Raqqa’s history is being forgotten? The problem is the media only discussed ISIS. Nobody really talks about Raqqa’s history. Raqqa was once the capital of the Abbasid Caliphate, [from 796 until 809]. It was a big city until the Mongol invasion leveled it to the ground [during the 1260’s], almost like today. It stayed abandoned and uninhabited until the 19th century, when people came to live there. My family was one of the first ones to arrive to settle and has been there for two hundred years. One of my great-grandparents was the first Sharif of the city,—the equivalent of a mayor. Before fleeing the city, I had only traveled out of Raqqa once: to Aleppo. But I don’t expect to come back to Raqqa anymore. It’s really hard to think about the beginning of the revolution, compared to what we are living through today. We are all disappointed and have lost hope of changing the regime. But before, we couldn’t discuss politics, there was a saying about the walls having ears. Anyone talking about the regime was disappeared or arrested and Assad was seen as some sort of a holy man, who could not be touched. The revolution erased all this. It changed the people, how they think and act. Even those loyal to Assad are now sometimes protesting the corruption. When talking about anti-colonial revolutions, Frantz Fanon explained that they happened not because of a society rediscovering its precolonial culture, but “simply” because the people “could no longer breathe”. This can be applied to Syria, too. Living in Syria before the revolution was like hell where we couldn’t breathe, fulfilling our basic needs, yet not allowed to think. Syria will never be the same.